MY AUDIENCE WITH THE POPE OF TRASH! I am not ashamed to admit it. 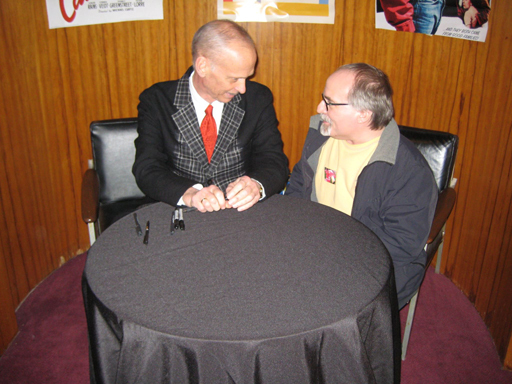 John Waters has been a huge influence in my life and career. In one person, he virtually sums up what Baltimore is all about. I’ve known him since I was in college (having been introduced by the late great Edith Massey), but this was our first meeting as…well…colleagues. I will never be his equal. John is one of the great raconteurs of our time and just hearing him talk is pure entertainment. “Not Safe For Work” entertainment, but entertainment nonetheless. I hope he lives to be 100. And if you haven’t seen “Pecker” – what are you waiting for? Previous Article← WE MEANT TO DO THAT!